What to Do for One-Day Stay in Jakarta? Hi There! What can you do if you only stay one full day in Jakarta? Let’s say you arrive on Saturday night. You actually can go to the main street Jalan Sudirman to Jalan Thamrin in the next morning . The streets hold car free day where it is free from any cars from 6 to 11 am on Sundays. If you like exercise, you can join with the crowds. The 6.6-kilometer street is ideal for jogging or brisk walking. Sometimes you can enjoy a street performance on Hotel Indonesia Circle (Bundaran HI). 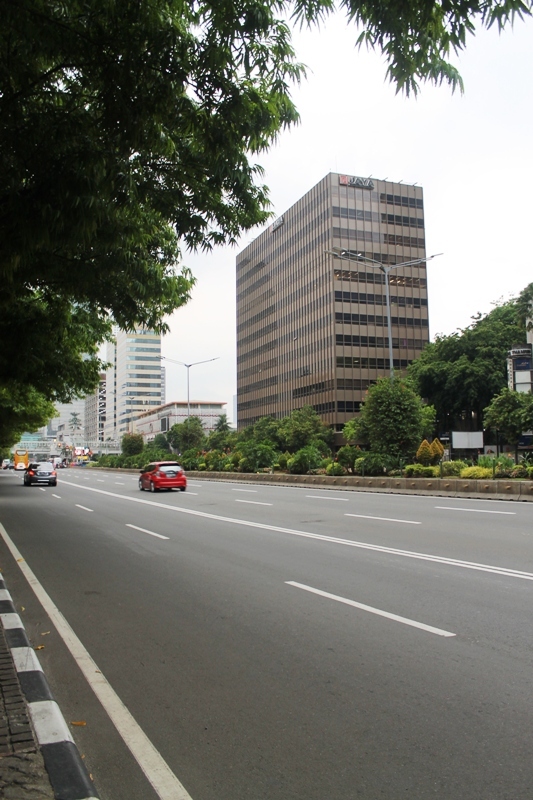 Jalan Thamrin is the main street of Jakarta where commercial offices and starred hotels are located. What can you do if you arrive on weekdays? Morning: On peak hours, the streets in Jakarta are very busy packed with vehicles. 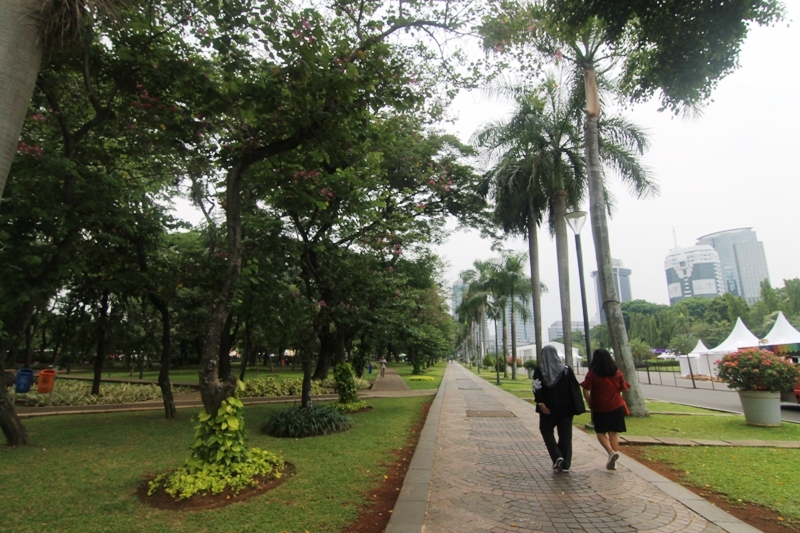 You can do jogging in Monas (National Monument) Park (see article: xxxx) or roam around the Park. Try to climb to the top of Monas. Remember, it is closed on Mondays. If you come on school holidays, the queue in ticket booth is long. When you get there early, you will be the first in the queue. Inside Monas you can see the biorama of Indonesian history from the old time to today. From the top of Monas you can see most parts of Jakarta. It is worthy to get the whole view of the city. Leaving Monas, you can browse the so-so quality souvenirs in the kiosk by the Park entrance gate. The Park in Monument National is not bad for walking and jogging in the early morning. Do you want to sip a cup of coffee or tea after visiting Monas Park? Just walk down to Jalan Sabang, it used to be an old shopping galore in the central of Jakarta. It is the only remaining street in Jakarta with row of shops on both of its sides. The coffee house is hidden among the restaurants and commercial houses. Kopi Tiam is in the corner of the street. From there you can go to your next destination: Kota Tua area. You can go there by Transjakarta bus. From Jalan Sabang, walk to Jalan Thamrin at Sarinah bus stop. 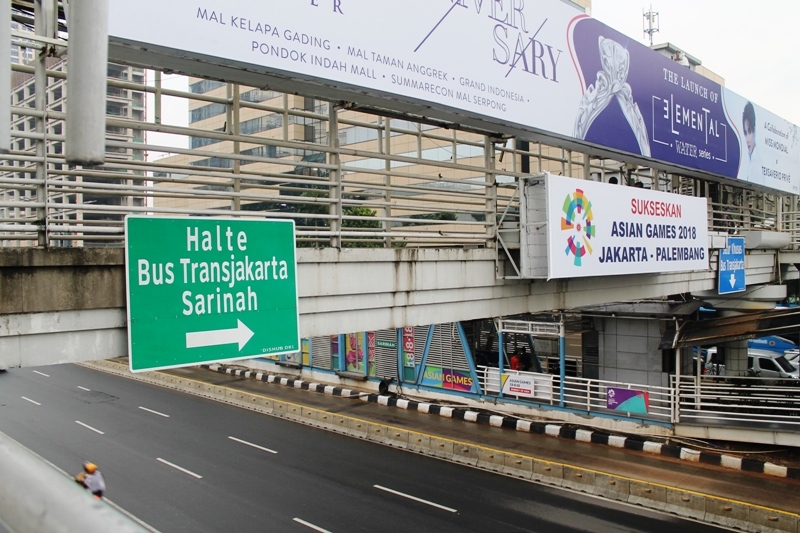 The pedestrian bridge in Sarinah to the bus stop of Transjakarta bus. 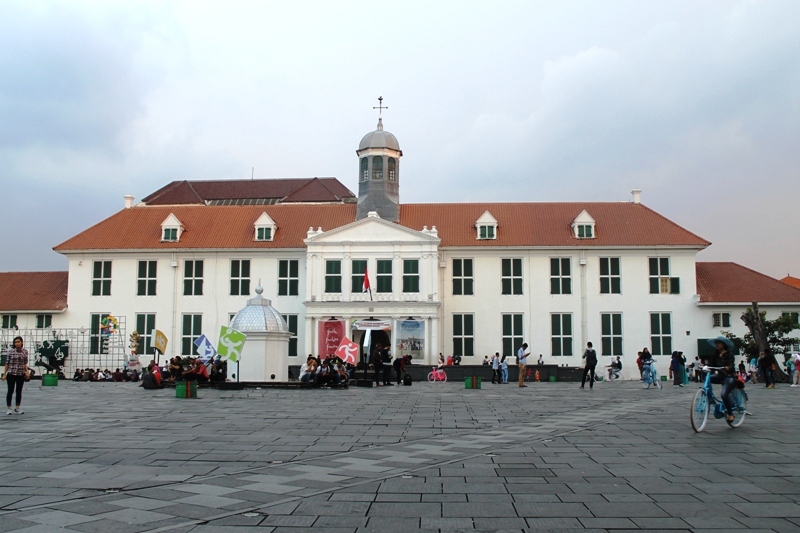 Noon: Kota Tua or Old City is another must see site. Here you can feel the atmosphere of Jakarta during colonial time. If you are a museum freak, it is also your area. The museums in Kota Tua include Indonesia History Museum (Museum Fatahillah), Museum of Fine Arts and Ceramic, Museum Wayang, Museum Bank Indonesia, and Museum Bank Mandiri. They are all walking distance to one and another. Remember on Monday, those museums are closed. Museum Bank Indonesia in Kota Tua (Old City) area. You can start your trip at the Bank museum (if you like museums). 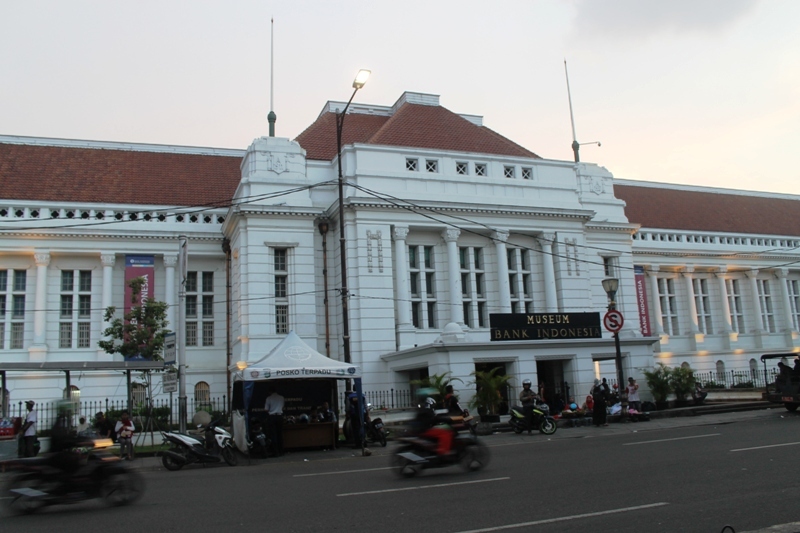 Otherwise, you can start at Indonesia History Museum, which is the former seat of General Governor of Batavia (old name of Jakarta). The museum yard is crowded with visitors on weekend and there are some performances. There is also a bicycle guided tour to explore the area and to get some historical information. On Sundays, Museum Wayang (Puppet) sometimes has performances. If you want to have lunch with a little luxury, there is a high-end Café Batavia. There you can enjoy the European and Asian dishes inside a chic colonial building. 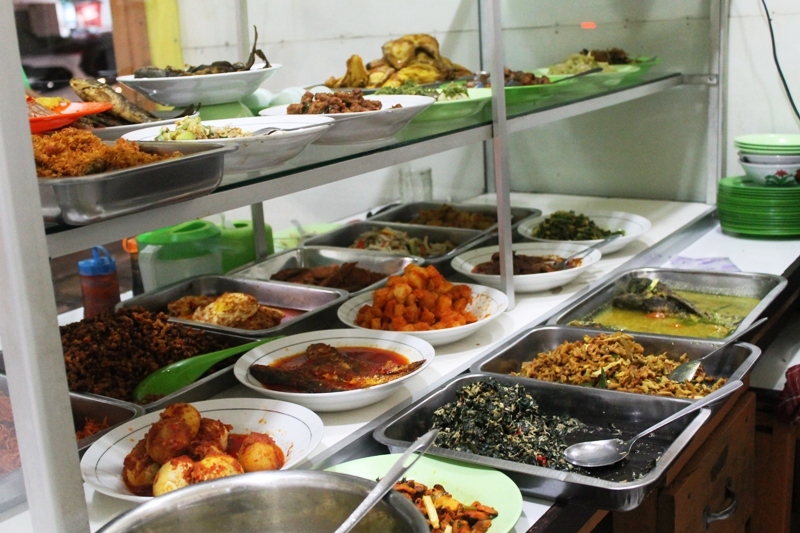 For lower budget you can go to Batavia Market located on Jalan Taman Fatahillah. Depending on your interest you can spend 2-3 hours in Kota Tua. This includes the time to visit the museum of your interest. Afternoon: Do you like shopping? There are some recommended places to shop for tourists. You can go to Sarinah. From the second to fourth floor you will find a myriad of souvenirs from across Indonesia. It is a convenient place to shop good quality souvenirs. If you need electronics, you can go to Mangga Dua. Sarinah Department Story is the right place to find souvenirs. Check in the 2nd to 4th floor. Evening: Where to go for dinner? It all depends on your belly and pocket. Are you familiar with street food in South east Asian countries? If your belly doesn’t have issue with Asian street food. Then, you can go to Jalan Sabang where food vendors fill in the street. Or you can try the ones nearby Stasiun Cikini, or even on Jalan Jaksa. Be cautious if you eat on the street: watch your belongings. Typical food street kiosk in Jakarta. Are you concerned with hygiene and your belly? Don’t risk yourself, go to Grand Indonesia food court on 3rd floor. You will find many food outlets there that cater you budget. 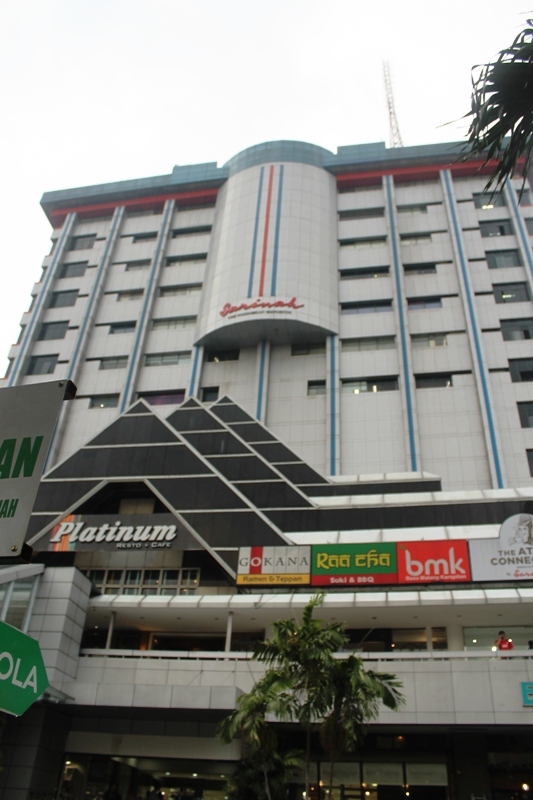 Grand Indonesia is located by Bundaran HI on Jalan Thamrin. In the next post, I’ll show you how to commute in Jakarta to tourists friendly destinations. Enjoy Jakarta!